Modern Portfolio Theory explores how risk averse investors construct portfolios in order to optimize market risk against expected returns. The theory quantifies the benefits of diversification. Modern Portfolio Theory provides a broad context for understanding the interactions of systematic risk and reward. It has profoundly shaped how institutional portfolios are managed, and has motivated the use of passive investment management techniques, and the mathematics of MPT is used extensively in financial risk management. 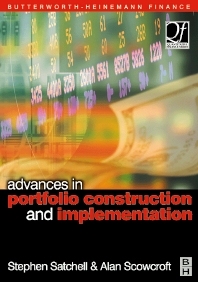 Advances in Portfolio Construction and Implementation offers practical guidance in addition to the theory, and is therefore ideal for Risk Mangers, Actuaries, Investment Managers, and Consultants worldwide. Issues are covered from a global perspective and all the recent developments of financial risk management are presented. Although not designed as an academic text, it should be useful to graduate students in finance. Risk Managers, Actuaries, Investment Managers, and Consultants. Stephen Satchell is a Fellow of Trinity College, the Reader in Financial Econometrics at the University of Cambridge and Visiting Professor at Birkbeck College, City University Business School and University of Technology, Sydney. He provides consultancy for a range of city institutions in the broad area of quantitative finance. He has published papers in many journals and has a particular interest in risk. Consultant to financial institutions and Reader in Financial Econometrics at Trinity College, Cambridge, Stephen Satchell is Editor-in-Chief of the Journal of Asset Management and Derivatives, Use, Trading, and Regulation. He has edited or authored over 20 books on finance. Alan is a Managing Director and the Global Head of Equities Quantitative Research at UBS Warburg. Since joining UBS Phillips & Drew as an econometrician in 1984, he has worked on every aspect of quantitative modelling from stock valuation to asset allocation. He has been closely associated with the pioneering work on equity style and portfolio analysis developed by UBS Warburg. Alan was educated at Ruskin College, Oxford and Wolfson College, Cambridge where he was awarded the Jennings prize for academic achievement. Managing Director and the Global Head of Equities Quantitative Research, UBS Warburg.